Wire wrapped pendant made from sterling silver and tumble polished gray banded agate (Spirit Agate) from Mexico. Includes a cord. 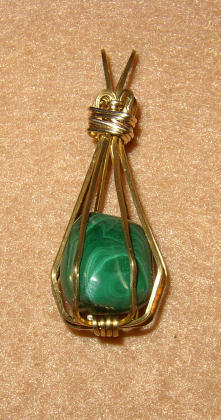 Wire wrapped bird cage pendant made from 14/20 gold fill wire and tumble polished Malachite from South Africa. Includes a cord. 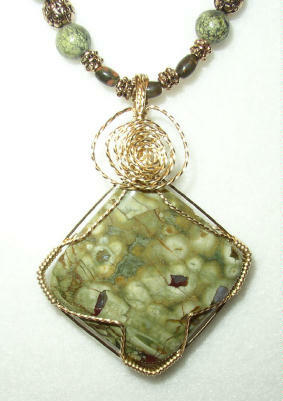 Wire wrapped pendant made from 14/20 gold fill wire and tumble polished Dinosaur Bone from the Dakotas. Includes a cord. 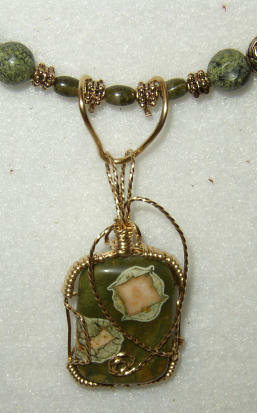 Wire wrapped pendant made from 14/20 gold fill wire and tumble polished Petrified Wood from East Texas. The eyes and face almost brings it alive! Includes a cord. 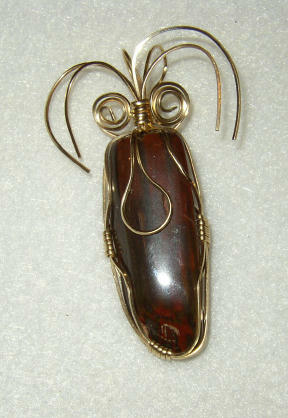 Wire wrapped pendant made from 14/20 gold fill wire and tumble polished Petrified Palm Wood from East Texas. Includes a cord. 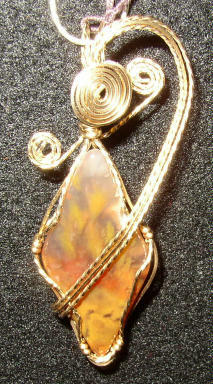 Wire wrapped pendant made from 14/20 gold fill wire, cut and tumble polished Plume Agate from the Texas Big Bend area. Includes a cord. 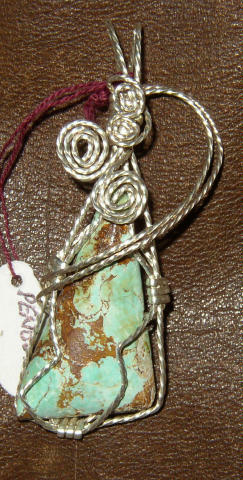 Wire wrapped pendant made from sterling silver, cut and polished Turquoise from Arizona. Includes a cord. 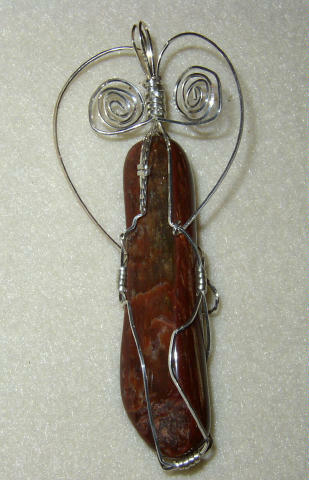 Wire wrapped pendant made from sterling silver and tumble polished Petrified Wood from East Texas. The eyes and face almost brings it alive! Includes a cord. Wire wrapped pendant made from sterling silver and tumble polished Tiger Iron from Australia. The eyes and face almost brings it alive! Includes a cord.